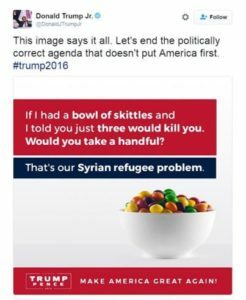 When Donald Trump Jr. breezily compared Syrian refugees to a bowl of Skittles, it revealed once again the Trump Culture so coldly detached from today’s bloodily inhuman conflicts. At 38, “Skittles” Trump, as he shall now be known, is the dauphin who someday will inherit billions from Daddy’s purse and sees no reason to cast himself today as a worry wart over other people’s hardship. As news sources begin taking a closer look at him, they are finding copious evidence that he has become the poster figure for right-wing militants, racists and other radical groups that joined his father to make America great. Reuters reported that Junior Skittles appeared on a conservative Utah radio show described by the Southern Poverty Law Center as “racist and anti-Semitic”. He apparently also has a pal in James Edwards, another conservative talk show host. Edwards says his show promotes a “proud, paleoconservative Christian worldview” and dismisses any views the show is the work of “white supremacists”. Skittles Trump also denied evil intent in an Instagram that pictures him and the Trump family with Pepe the Frog, which was lifted as the mascot of the “alt-right” – the hood ornament of white nationalists, and anti-Semites. Junior Skittles said, however that he had never heard of Pepe the Frog. That sounds a lot like Trump Sr.’s. reaction to another iissue in which he insisted that he knew nothing of David Duke or the Ku Klux Klan.